No. 53 This property is an upside down Townhouse with a double bedroom with en-suite & twin room, a master bathroom on the ground floor. All our bedrooms are well finished with bespoke made furniture included in every room. On the first floor there is a second twin room and open are kitchen/dinning/sitting area. The kitchen is finished with all utensils that you would expect. Recently converted into stylish, low carbon, self-catering accommodation, The Pyjama Factory is a 4 star Northern Ireland Tourist Board (NITB) approved property. The building was originally used as a grain store which dates back to the 1800s, but in more recent times has been used by a textiles company to produce pyjamas that were sold all over Ireland. 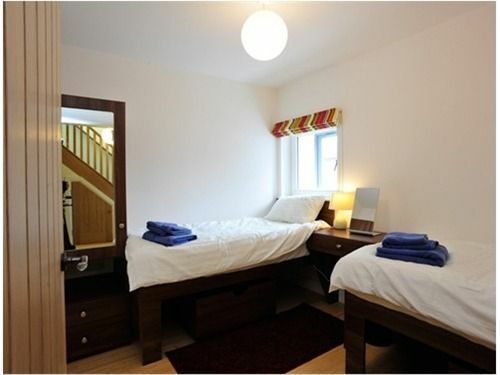 Just 2 miles away from the spectacular Giants Causeway, The Pyjama Factory is located in the heart of an area outstanding natural beauty, which is rich in history and Irish folklore. The building has been converted into 2 stylish townhouses and 2 characteristic apartments that offer the perfect base for family, golf, surfing and walking holidays or for those who are just looking to relax. Based in the heart of the historical town of Bushmills in Northern Ireland you are just minutes away from the amazing attractions the area has to offer.